The Walloon Regional Transport Company (OTW) awarded Tram’Ardent consortium the design, building, financing and maintenance contract for the 12-km tram line in Liège. The consortium comprises DIF Infrastructure V (80%), French civil construction firm Colas (10%) and CAF (10%). 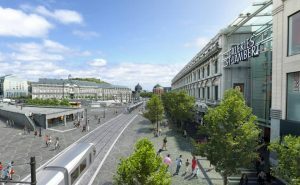 The tram line will be constructed in the centre of Liège between Sclessin, Coronmeuse and Bressoux Station. 3 km of the total 12-km line will be catenary free. Under the project, 21 stops, a maintenance depot and 2 park-and-ride facilities will be built. The project also envisages improvements to the surrounding urban area. The construction of the tram line will be launched in May and will be completed in the second half of 2022. The line will be operated by 20 trams, carrying 310 passengers each. Under the contract, consortium will maintain the project for circa 27 years, until 2050. Total funding for the project amounts to EUR 429 million, including long-term debt secured from the European Investment Bank, Belfius, BBVA, Natixis, AG Insurance and Talanx. The EIB will fund half of the term loan, totalling EUR 193 million, backed by the European Fund for Strategic Investments (EFSI). The tram line is considered the real backbone of Liège transport system and it will be connected to the existing transport systems. A multimodal triangle will be formed by the Guillemins station, the tram station and the TEC buses.